Company «Rohde & Schwarz». 60 people. Moscow. 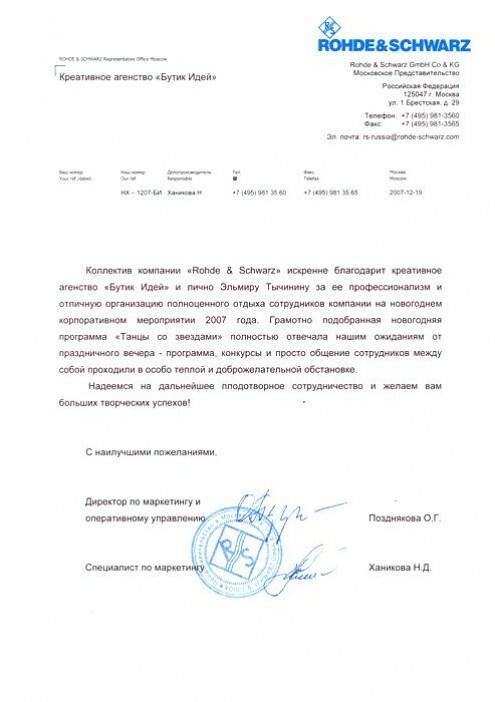 The staff of company Rohde & Schwarz expresses its sincere gratitude to the creative agency "Boutique of Ideas" and personally Elmira Tychinina for her professionalism and excellent organization of full relaxation of employees. The wisely-chosen program "Dancing the Celebrities" absolutely met our expectations from the holiday night – the program, competitions and just employees communications were held in warm and friendly atmosphere.